To start, a while back I mentioned that I’d like to soon release a coffee table book on my LEGO sculptures and photography. I wanted to use a photo of my custom Amish magnifigure for the front cover, but then I discussed the idea with some friends and finally decided to use an epic creation for the cover. That being said, I’ve broken ground (to say the least) for the front cover — by creating a 1:1 sculpture of my own head! 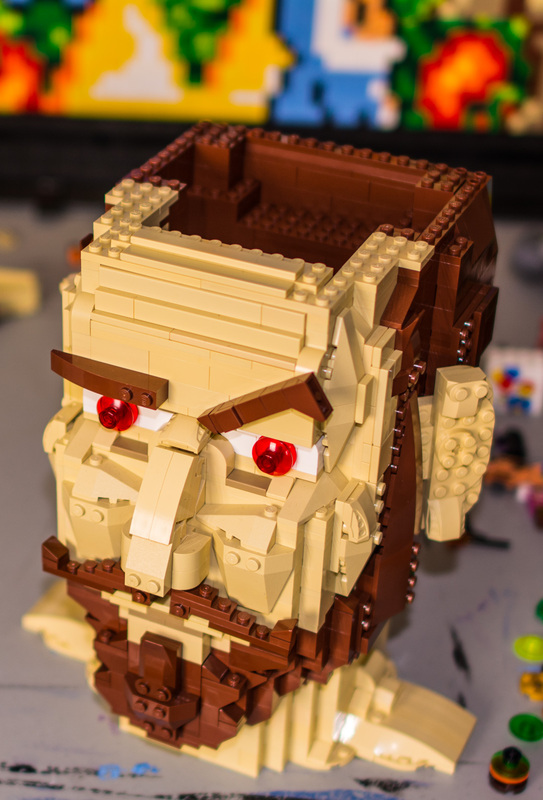 The final completed version of this head will contain a removable top piece (like a cookie jar), so that electronic components can be installed inside the cranium. As evidenced by the creepy red irises, there shall be illuminated LEDs inside the eyes. Most likely with a push of a button, the head will pop off so that music can play as the eyes blink. 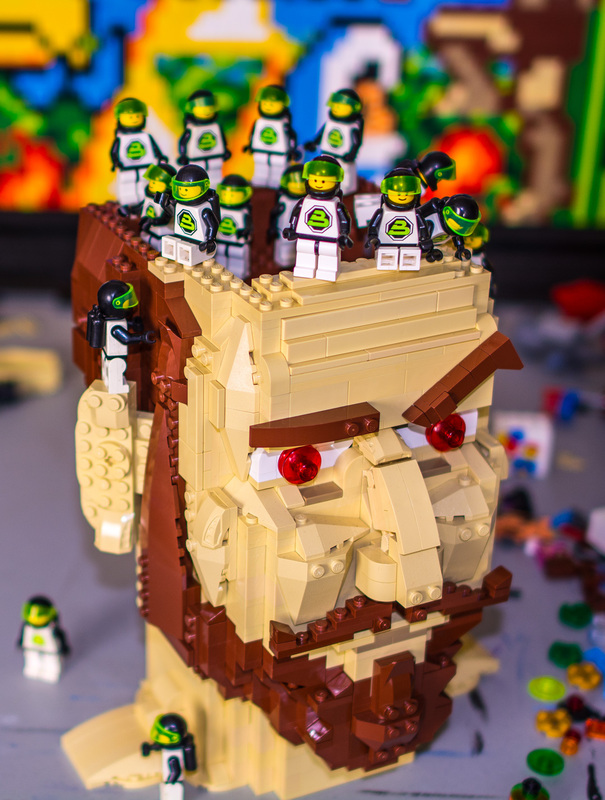 On the front cover of the book, this head shall be prominently displayed along with some other relevant LEGO creations and minifigs. 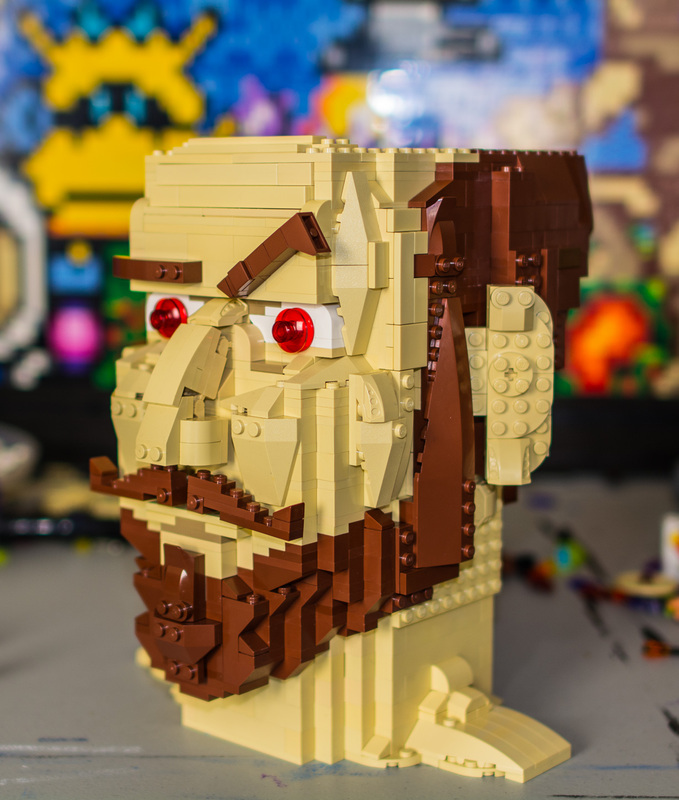 For a title, I’m thinking of something like “Block Head Master” or “Polymer Madness” — something to emphasis the plastic material of LEGO toys, in addition to my psychotic creative process! From a technical standpoint, this head is built within accurate measurements of my own head, including the eyebrows, cheekbones, neck, and mouth. The bulbous hook-nose is slightly exaggerated, of course. Also, I couldn’t quite get the proper dark hazel color of my eyes, so I’ll just go with the glowing red like like Terminator! In other news, I’m no longer employed as a graphic designer for the sports industry in Long Island: I’ve recently begun a new graphic design position for the wallet company DYNOMIGHTY! Now I’m working in DUMBO, Brooklyn, so hopefully this summer I could maybe move from Queens to Brooklyn. Everything’s are coming up Milhouse Julius!